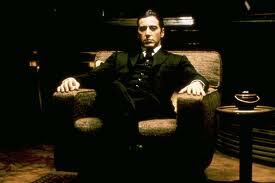 Why do I have to watch The Godfather whenever it is on TV? Scanning the channels last night and sure enough, on A&E, there it is. Don Vito, Michael, Sonny, Clemenza, Luca, Tessio and the rest of the Corleone family. What is it about this movie that is so riveting? It is not like I do not know what is going to happen, nor I am a big fan of blood and guts spewed all over the place, but I continue to be fascinated by the story. And get this, it is the 40th anniversary of the first Godfather movie. 1972, geez, that seems like a long time ago. Like the great bands of the 60’s and 70’s, some things just withstand the test of time and the Godfather is one of them. When I tuned in last night Luca Brasi was about to have his final meeting with Sollozzo in Bruno Tattaglia‘s bar. We know what happened here. 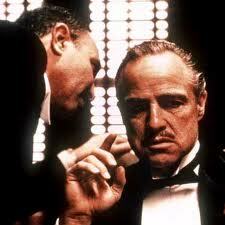 Clemenza: It’s a Sicilian message. It means Luca Brasi sleeps with the fishes. Within the family we have the impulsive son, Sonny, the son that has never fit in, Fredo and of course we have Michael, the son that wanted nothing to do with the family business but once he committed to his father, he never looks back. Michael: [to the Don, quietly] Just lie here, Pop. I’ll take care of you now. I’m with you now. I’m with you. So many great lines, so many interesting relationships. The acting in this movie is incredible. Francis Ford Coppola did an awesome job with the lighting, the pacing, the story, the sub-stories and of course the emergence of Michael as the Don. Al Pacino is a fine actor but there is no performance in his career than this one. Not Scarface, Donnie Brasco, Dog Day Afternoon or any other movie he made. This is his best work. How could he possibly top this performance anyway. So many great lines in this movie. Here are two of my favorites. Michael: [speaking to Carlo] Only don’t tell me you’re innocent. Because it insults my intelligence and makes me very angry. A&E will be playing the movies this weekend. I am sure to be watching yet again.